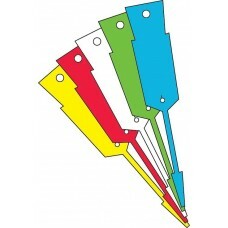 Our vinyl disposable key tags are available in a variety of colours, so you can easily sort them into specific groups if needed. They can be easily thread through any type of key, removing the need for metal rings. And with self-locking features, they will stay securely in place until you decide to remove them. Just pull each tag away from the sheet that it is positioned on, push the arrow head through the key hole and bring back on itself through the designated keytag hole with custom a slit to ensure easy threading and twist to enable the self-locking feature. This will create a loop securing the keytag to the key. Each pack of disposable keytags comes in a sealable storage box, so they can be kept securely together. Also, each pack of disposable keytags has a free permanent marker pen which we recommend that you use - however, details can be also be written on each disposable key tag with a pencil or pen and won’t smudge, so text will remain legible over time. Whether you have a car service company, a bicycle store or just several keys at home that need organizing, our disposable keytags may be just what you need! Available in packs of 1000 tags.